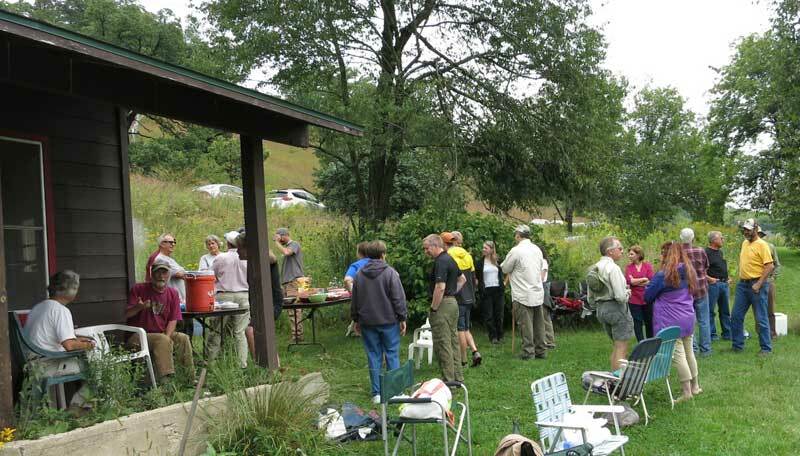 Yesterday the rains ended just in time for the Wisconsin State Natural Areas volunteers potluck lunch and tour at Pleasant Valley Conservancy. A large turnout made the event especially nice. There were quite a few attendees from southeastern Wisconsin and from the Prairie Bluff Chapter (Green County) of the Prairie Enthusiasts. The event was organized by DNR volunteer coordinator Jared Urban and State Natural Areas crew chief Nate Fayram. The 3-hour tour was led by Kathie and Tom Brock. The Conservancy was looking especially nice after the 2 inch rain the night before. This time of year warm-season grasses are especially lush, making the large hill prairies look very attractive. The tour focused especially on the major oak savanna restoration work that has been an ongoing activity at PVC for the past 20 years. The tour ended with a walk along the Diagonal Trail that crosses the middle of the bluff prairie. This is the time of year when Rudbeckia triloba (brown-eyed Susan) is in bloom. It is either a biennial or short-lived perennial, and apparently spreads well from seed. It is a nice plant, and blooms at a time when many prairie/savanna plants are finished flowering. Gardeners also like it and it is easy to get started in a native flower garden. For some reason, this species has a bad reputation among Wisconsin "purists", apparently because it is often found growing in disturbed areas such as roadsides, railroad tracks, stream banks, or even urban settings such as vacant lots. Is it native or introduced? Per Swink and Wilhelm (Plants of the Chicago Area): "Although it appears to be native to our area, its occurrence here [disturbed areas] often suggests an escape from cultivation, or at least a history of severe disturbance---not a stable native community." Per Antonio and Masi (The Sunflower Family in the Upper Midwest): "Brown-eyed Susan has become a late summer garden plant" and "cultivars have been selected for the horticultural trade." Per Cochrane and Iltis (Atlas of the Wisconsin Prairie and Savanna Flora): "Considered to be native to our region, although often inhabiting severely disturbed communities." On the other hand (Minnesota Wildflowers): "While a Minnesota species of special concern in the wild from loss of habitat to agriculture and invasive species, brown-eyed Susan flourishes in gardens across the state." In order to get an idea of its Wisconsin distribution, I went through the Wisconsin Herbarium website for individual records of this species, with special attention to early collections (before prairie planting came into vogue). Although many of the collections were from what could be called "disturbed" areas (railroads, roadsides, lakeshores, stream banks), on 8/15/1947 Phillip Whitford found it in a "prairie relic" by Oak Hills Cemetery, Black Earth. Note that there are other "native" species that are found in "disturbed" areas. For instance, spiderwort (railroad ballast), flowering spurge (roadsides), glade mallow (roadsides and stream banks), black-eyed Susan (roadsides), and prairie dock (roadsides). 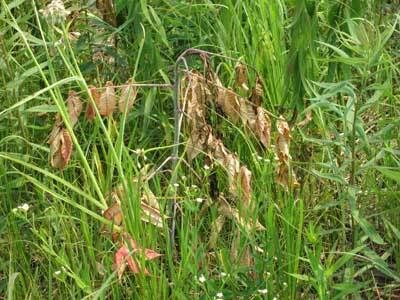 Species that grow in disturbed areas are often thought to be invasive. 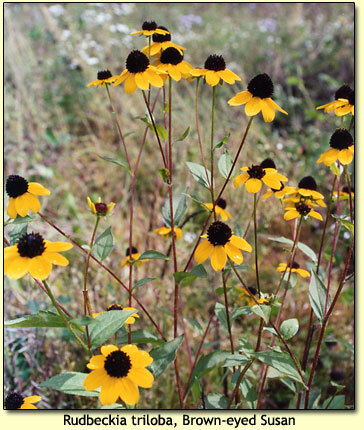 However, there is no evidence that Rudbeckia triloba is invasive. We first planted this as a desirable species for open oak savannas around the year 2000. It has been in our prairie/savanna species list since 2002 but has never "taken over" any area in which it is growing. It is an attractive plant that makes a nice contribution to the late summer savannas and prairies. We don't mind that it is also grown in gardens. Dozens of other prairie and savanna forbs are also grown in gardens. 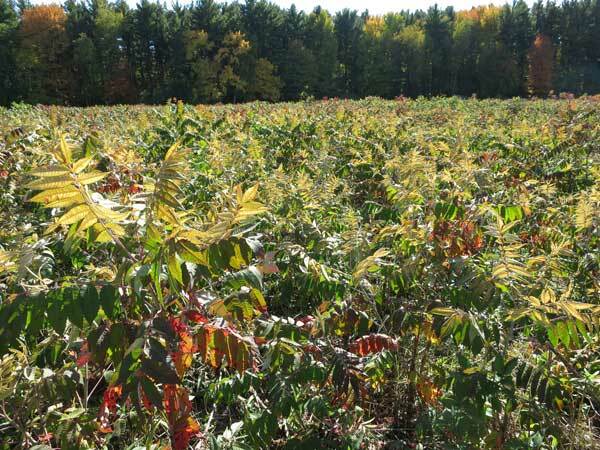 In 2012 I published some photos of a well-known prairie that had become over-run with smooth and staghorn sumac (Rhus spp.). One of these photos is shown here. See this link for further details. Sumac infestation of the prairie. Photo taken Oct. 2012. It was unfortunate that this prairie was allowed to become invaded, but recent work shows that it was not too late to save it. In the late fall/early winter of 2014 the large patch shown was mowed. Soon after mowing all the cut stems were treated with Garlon 4 in oil, using backpack sprayers. This major job took several days, but at least came at the time of year when no other work on this prairie was needed. Upon returning to the prairie this year I was gratified to see how well it was recovering! The same area in July 2015. The species diversity is quite high. Although the prairie is coming back, the sumac has not been idle. This species, like many other clonal species, exhibits the phenomenon of root suckering. Dormant buds among rhizomes still alive underground are activated and send up new shoots. Early in the season, when the prairie vegetation was not too lush and would not be damaged, these root suckers were killed by foliar spray with Garlon 3A. Later in the summer, when prairie plants have occupied most of the land, it is difficult to spray sumac resprouts without damaging good plants. 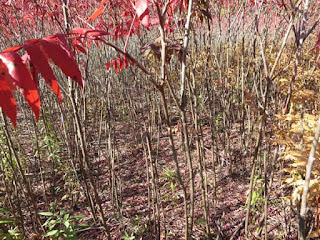 At that time of year, the sumac stems are killed by basal bark treatment with Garlon 4 in oil. Where have all these prairie plants come from? 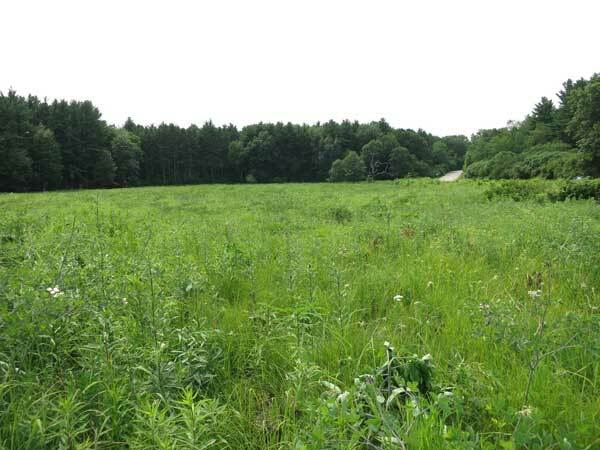 The photo below shows what the land looked like in 2012. 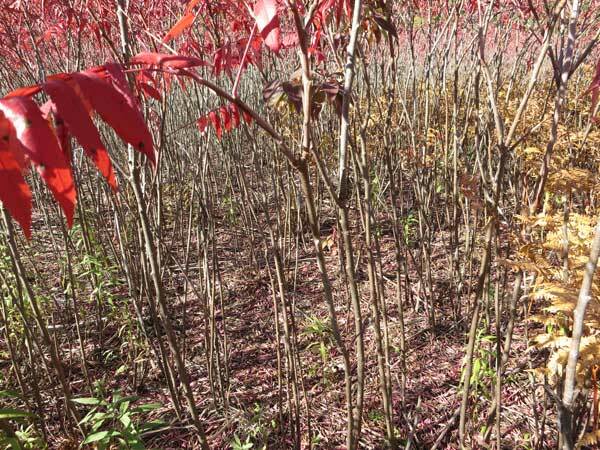 The sumac infestation was so dense that the ground underneath was almost completely barren. The reasonable conclusion is that buried throughout were living roots and dormant buds of the prairie plants that had originally been present. As soon as the sumac was eliminated, these "good" plants were released, sent up new shoots, and recolonized the site. Note that this is not colonization from a seed bank. Although there were certainly viable seeds at the site, the plants that came up were not seedlings, but vigorous shoots from dormant buds. Which prairie plant species? The grasses (Indian grass, big bluestem) are certainly survivors. White wild indigo was very visible in July and obviously had not come from seed. 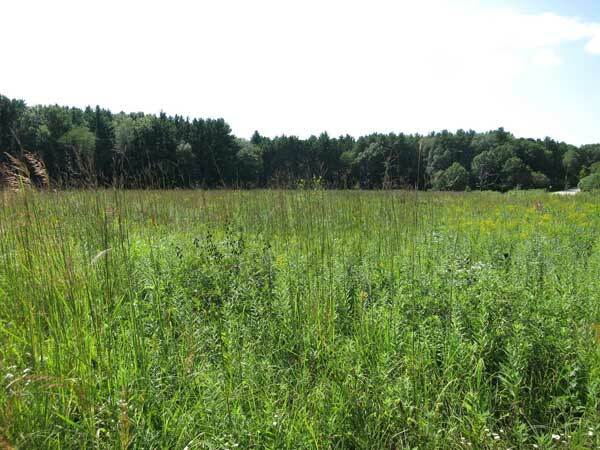 Unknown is how long prairie plants will remain alive buried underneath a stand of woody plants. This would seem like a good research study! Yesterday with the interns I was discussing the concept of C values (Coefficient of Conservatism). C values are widely used in restoration ecology when deciding whether a site merits restoration work. Each native species is assigned a value from 0 to 10, that represents the probability that this plant species is likely to occur in landscapes relatively unaltered from those of pre-settlement times. Plant species with high C values are relatively specialized in their requirements, and thus are found in more restricted habitats. Thus, a widespread species such as Canada goldenrod (Solidago canadensis), found in numerous habitats from roadsides to remnant prairies, is assigned a value of 1 whereas prairie dropseed (Sporobolus heterolepis), found almost exclusively on high-quality remnant prairies, has a value of 10. A set of C values for all members of the Wisconsin flora has been published by the Wisconsin Department of Natural Areas. The C value for each native species is also given on the University of Wisconsin-Madison Herbarium web site and in Wildflowers of Wisconsin and the Upper Midwest, by Merel Black and Emmet J. Judziewicz, University of Wisconsin Press, Madison, Wisconsin. Pleasant Valley Conservancy has quite a few plant species with high C values. Some of these species were native to the site and others have been introduced and are surviving well on their own. The table below is a list of the high C value plants (C ranging from 7 through 10) that are fairly widespread at Pleasant Valley Conservancy. Most of the native species have also been planted at other areas on the Conservancy in order to extend their range. In addition to the above species which are widespread, a few species native to the site are well-established in only a few restricted areas. These include: hoary puccoon (10), purple milkweed (9), fringed puccoon (8), and prairie turnip (8). The photos accompanying this report of an escape fire incident are surprising and instructive. Who knew a UTV could be so flammable? 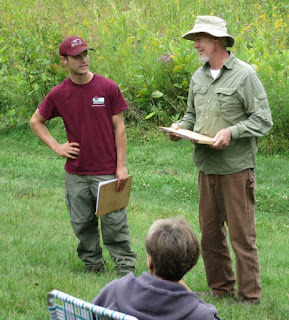 Screen shot from the Facilitated Learning Analysis of the Cold Brook (S.D.) Escaped Prescribed Burn. 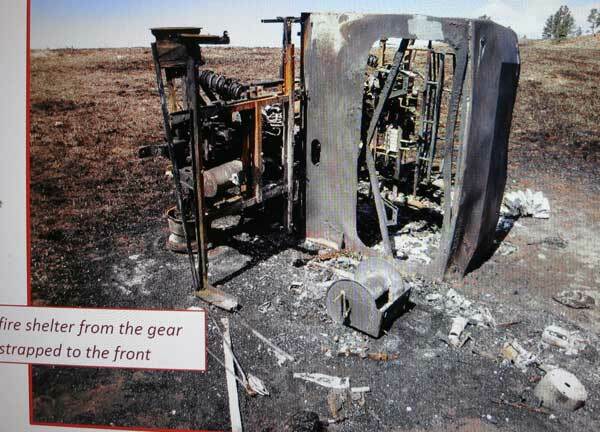 The UTV ignited within seconds of the crew escaping after it rolled. The fire escape (which turned into a wildfire) occurred on April 13, 2015 during a 1000-acre prescribed burn within Wind Cave National Park in South Dakota. The details of the burn, and extensive analysis, are given in the link posted above. The burn unit consisted of grass understory with some brushy components along with dense and open ponderosa pine stands. The area where the UTV incident occurred was almost solely grass. Although green-up had begun, it was still early in the growing season, and most of the fuel was fairly tall well-cured grass. The objective of the burn was to reduce thatch and to kill seedlings and pole size pines. When the escape occurred, two UTVs were sent to control the fire. The UTV that was to come to grief crested a mild slope and was surprised to find the fire ahead of it and below. It quickly circled to get out ahead of the flame front, began a slow-motion movement along the side-slope, and tipped, coming to rest on its right side. Both the operator and passenger quickly exited. With the UTV on its side, the pumper was no longer working. Fortunately, the crew found an escape route safely into the black. According to one crew member, the approaching fire was very hot and the "UTV torched right away". There were some indications that the weight distribution and tank design made the UTV unsteady. In addition, the operator was unfamiliar with the power steering with which this (Polaris) UTV was equipped, and oversteered, thus causing the UTV to tip on its side. Seat belts were present in the UTV but neither person was strapped in. It is likely that if they had been strapped in, they would have been burned up along with the vehicle. Why did the UTV, which is mostly metal, burn up?